You can’t be everywhere as a teacher or school administrator but you know you can always do more to put the elements in place for more complete school safety. Yes, you figure it takes a special combination of supplies and training. The question is: How do you even begin to know what kind of supplies you might need? Where would those supplies be located and how many of these items is sufficient? What kind of emergency response training does your staff need? Let’s take a quick look at the essentials and then we’ll provide you with an easy way to ensure you’ve checked all the boxes on many of the major safety items and know-how your staff should have in place every day the bell rings. Ice packs, gauze pads, adhesive tape, burn aid dressing, disposable nitrile gloves, tweezers, thermometer, bandage scissors, antiseptic wipes, antibiotic ointment, hand sanitizer, bandages, and emergency eyewash. Don’t make the mistake of putting your first aid items in one location alone, like the school office. Injuries can happen anywhere, after all. So in addition to common areas think about the classrooms that carry a higher degree of risk, such an industrial arts room, science lab or home economics class. 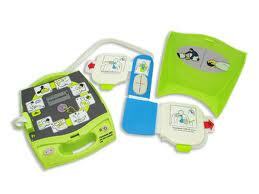 Fire extinguishers, bleeding control kits and Automated External Defibrillators (AEDs). When the hazard is far more serious and carries a life-threatening risk where there’s no time to spare, this is one category of product that you can’t be thin on. Obviously most school facilities will carry a fire extinguisher or two, but the locations may be few and far between. The same is also very true for AEDs – if there is an event of Sudden Cardiac Arrest and the victim has no more than 10 minutes to be resuscitated, having just one AED at the exact opposite end of the school could be a terrible miscalculation. Finally, a bleeding control kit=; complete with tourniquets, gauze and compression bandages is a critical component in responding to traumatic bleeding situations. Training on CPR, First Aid and AED operation. All teachers and school administrators should be trained on the latest methods for how to perform CPR and operate an AED as well as administer first aid. In a way, your people are their own mobile first aid stations everywhere they go throughout the school campus, which means it’s not enough to have a full array of safety-oriented products. Knowing when, where and how to use all of them is key. When combined with the knowledge of how to operate those products and perform key safety procedures, your staff can go a long way toward minimizing degrees of injury or even save a life. With The SOS School Safety Sweep. You’ve got plenty on your plate as it is. So how do you handle everything else that’s important for keeping your school running smoothly while bringing in the right supplies and tools for school safety? Don’t worry. SOS Emergency Response Technologies has thought of that with a program designed just for you. The SOS School Safety Sweep is a thorough yet highly efficient evaluation by one of our safety consultants at your school facility. So you don’t have to struggle to think about where you’re going to place that first aid cabinet or how many AEDs you need or who is and isn’t trained in CPR. After our walk-through of your facility and school campus, we’ll take care of the recommendations for you. And when it comes to all the essential safety training, we can bring your staff up to speed with interactive sessions that they can easily fit into their schedule.